GALION — Two Galion City Schools students will take their spelling talents on the road. 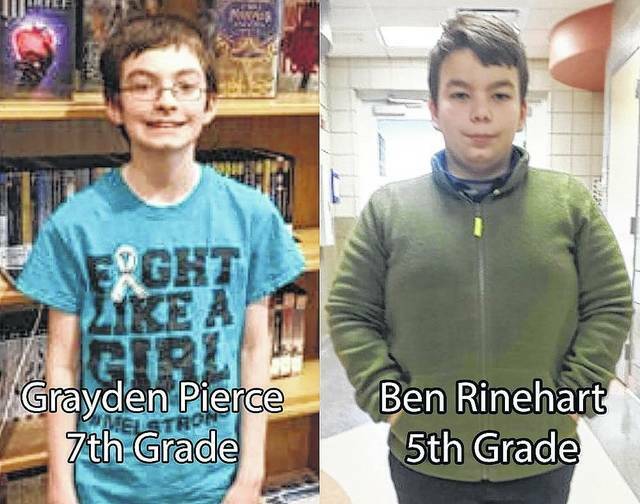 Seventh-grader Grayden Pierce and fifth-grader Ben Rinehart are two of 52 students who will compete in the Scripps Regional Spelling Bee at Ohio University in Athens on March 18. Qualifying for this event has been a long process. Both students competed in the district-wide spelling bee, finishing in the top six in the first competition. Both students represented Galion in the Crawford County Spelling Bee in January. Ben finished in the Top 12 and represented Galion in the Tri-County Spelling Bee at Mid-Ohio Educational Service Center in February. “We are very proud of Grayden and Ben for what they have accomplished,” said Superintendent Jim Grubbs. “We know Grayden and Ben will do very well in Athens, and wish them nothing but success as they compete and represent our school district. national competition in Washington DC. For more information about the spelling bee competitions in the Galion City School District, contact Leanna Ferreira at giesige.leanna@moesc.net.